We use homemade air dry clay for this project. But, you can use air dry or oven bake polymer clay too if you are familiar with that material. How to make to make pumpkin clay? This is the important step for the whole project. Insert toothpick to small styrofoam ball with glue. You can have bigger size if you want to make bigger figurine. Leave it until the glue dry. Make 7 or 8 ball shape from orange color clay. Roll and extend the two end of the ball shape. 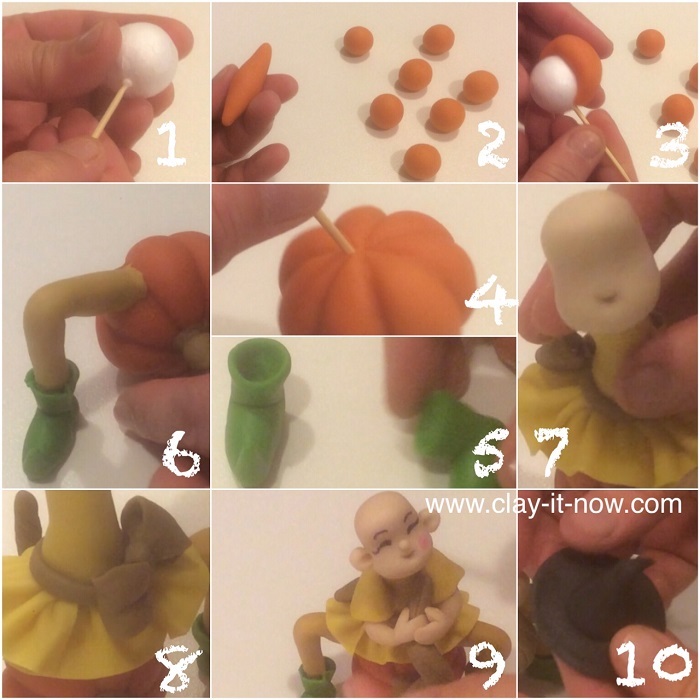 Apply glue on Styrofoam ball and attach the clay one by one. At the end I used 7 pieces of orange clay. Let it dry in room temperature if you use air dry clay or bake it if you use oven-baked clay. Well I stop here and continue my work in the next day. I always start with ball shape then change the shape to something like tear drop, flatten it a little bit and bent up about quarter of it. Use hollow tools to make a hole where we will insert the leg later on. I used light brown clay for the legs. Bent the middle part where the knees are. Make sure it is long enough to reach the base of the boot - insert to toothpick that we previously have left it on the boot. Insert another short piece of toothpick at top part and attach it to the pumpkin. Leave it this way until the legs dry and hard enough to go for the next step. Next, make the bottom part of the body and insert it between the two legs. My next steps were to make the skirt, top body part, head/ face feature, the sleeves, arms and hands, the hair and finally the witch hat.